When I’m looking for recipes that I know will work without any issue, that I know will be crowd-pleasers, and that I know I’ll enjoy cooking, I go to my collection of Ina Garten cookbooks. I’m so happy to add one more book to that category. The latest is Cooking for Jeffrey: A Barefoot Contessa Cookbook , and I received a review copy. This one is similar to her other books with soups and salads, dinner entrees, vegetables, and desserts. But this time, there are a few more personal stories included throughout, and there’s a chapter just for the cheese course. Ina occasionally mentions serving a cheese course before or instead of dessert, and it works well for a dinner party since it’s mostly just assembled before serving with any prepped items made in advance. 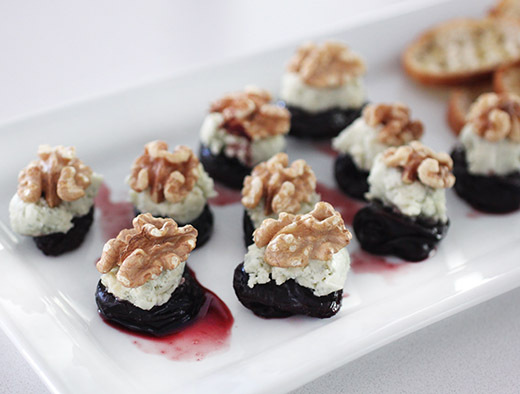 The recipes include a fig jam to serve on goat cheese bruschetta, a roasted plum chutney for serving with Mt. Tam which is one of my favorite cheeses, and English Oat Crackers to go with cheese and fruit. 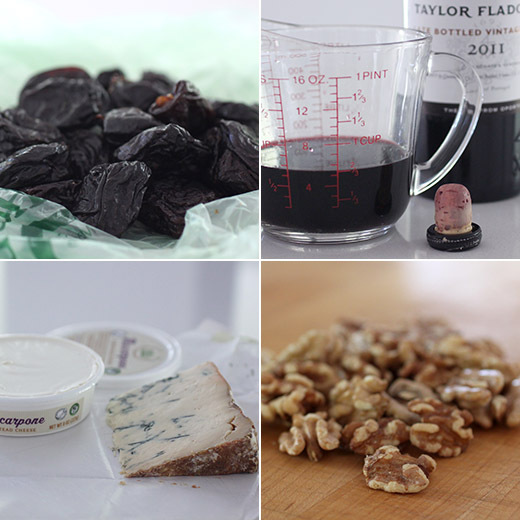 I was so interested in the cheese course chapter I had to make the Port Wine Prunes with Stilton and Walnuts before trying anything else. Some of the many other recipes I want to try soon are the Smoked Salmon Pizzas for cocktails, the “16 Bean” Pasta e Fagioli soup, the Crusty Baked Shells and Cauliflower, and the Vanilla Rum Panna Cotta with Salted Caramel. And, the Herb and Apple Bread Pudding and Pumpkin Flan with Maple Caramel have me pondering Thanksgiving menu possibilities. Getting back to the cheese course concept though, I like the idea of sometimes ending a meal with something not completely sweet or at least with a mix of sweet and savory. For the Port Wine Prunes, my only concern was that they would be messy to pick up and eat with your fingers. I imagined the wine would drip off the prunes and leave stains on the way to your mouth. To begin, the prunes were plumped by placing them in a single layer in a saucepan and adding Port wine. The wine was brought to a boil and them simmered for a few minutes before removing the pan from the heat, covering it, and leaving the prunes to steep for an hour. Stilton was crumbled and mashed together with some mascarpone. The cheese mixture was left in the refrigerator until serving time. Last, walnut halves were toasted. To assemble, the prunes were placed on a platter. 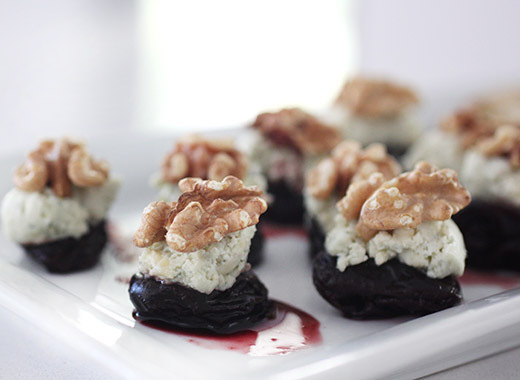 Each prune was topped with a spoonful of the Stilton mixture and then a walnut half. I should have known that Ina would have had a solution if these were messy to eat. The prunes weren’t drippy or messy at all. These are one-bite items, and they were easy to pop into your mouth with no issues. The classic flavor pairing of Port with Stilton was lovely, and the toasted walnuts added nice crunch. These were a delicious, simple way to end a meal and would also make a great addition to a larger cheese board. Reprinted from Cooking for Jeffrey . Copyright © 2016 by Ina Garten. Photographs by Quentin Bacon. Published by Clarkson Potter/Publishers, an imprint of Penguin Random House, LLC. One of my favorite things to serve for a cheese course or dessert is English Stilton and a glass of Port wine. This recipe combines both of those flavors with sweet prunes, and they’re a really surprising addition to any cheese board. Place the prunes in a saucepan just large enough to hold them in a single layer and add the Port. 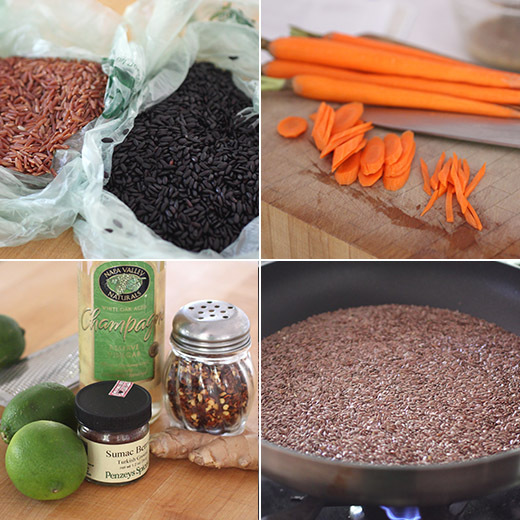 Bring to a boil, then lower the heat and simmer for 5 minutes. Remove from the heat, cover, and set aside for at least an hour for the prunes to become infused with the Port. Meanwhile, in a small bowl, mash the Stilton and mascarpone together with a fork. Cover and refrigerate. When ready to serve, place the slightly warm prunes on a serving platter, place a small mound of the cold Stilton mixture in the hollow of each prune, and top with a toasted walnut, pressing very lightly. Serve as part of a cheese platter. 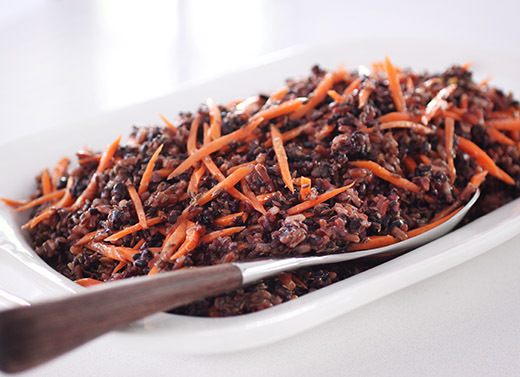 make ahead: Prepare the prunes and refrigerate for up to 4 days. Warm slightly, complete the recipe, and serve. I first heard about the restaurant Sqirl in Los Angeles from a magazine article reporting on the long lines of people waiting for toast. Of course, this wasn’t just any toast, and of course, they serve lots of other things too. Sqirl started as a jam company, hence the amazing toast, and now serves breakfast and lunch. The story of the restaurant and all the recipes are in the new book Everything I Want to Eat: Sqirl and the New California Cooking , and I received a review copy. There’s a mention in the introduction about how guests at the restaurant often order items and request all sorts of substitutions, and as it happens, the dishes adapt easily to various, little changes. 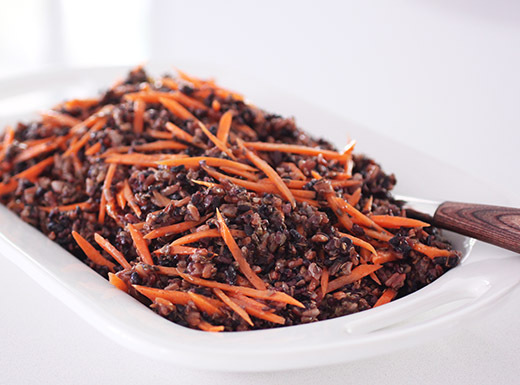 Several items are already gluten-free, and adapting dishes to make them vegetarian or vegan is very doable. The recipes cover Eggs and Toast, Grains and Beans, Vegetables, Meat, Fish, Jams, Desserts, and Drinks. For the famous toast, there’s actually not a recipe for the bread itself, but one inch thick slices of brioche are suggested for toasting and spreading with ricotta and jam or ganache and nut butter or almond hazelnut butter and jam. There’s a nice mix of decadence and nutritious options throughout the book. I’ve marked the page for a grain bowl with mung bean sprouts, crunchy buckwheat, and roasted squash with pomegranate seeds, labneh, and cilantro pistou. A few pages later, I’ve marked a salad made with a rich and lovely Southern-Style Fresh Cream and Black Mustard Dressing. Every dish is balanced mix of flavors and textures, and in some cases there are sub-recipes to prepare before pulling everything together. But, you can pick and choose the parts of a dish you wish to make and skip elements if you like. I love the look of the baguette toast shown a few times in the book. It’s a long slice from the full length of a baguette. For the Squid Toast, that long, skinny piece of toast is topped with aioli, roasted tomatoes, and seared squid. It looks pretty and delicious. The first recipe I tried was the Socca or chickpea flour pancakes. They’re made with grated vegetables depending on what’s in season. Winter squash is one suggestion, and I had a local butternut squash ready and waiting. Step one is to peel, seed, and grate the butternut squash which looked curiously like a pile of grated cheddar cheese. The grated squash was tossed with a little salt and left to drain in a sieve. Cumin, coriander, and fennel seeds were toasted and then ground in a mortar and pestle. Eggs were whisked and the drained squash was added with minced garlic, chopped oregano, cilantro, and basil in my case since I don’t have any mint growing. Chickpea flour was added with the ground spices along with salt and pepper, and the mixture was stirred to combine. Large pancakes were cooked in a hot pan with melted butter. Meanwhile, some arugula leaves were tossed with lemon juice, olive oil, and salt and pepper. I had started straining some thick yogurt the day before to make labneh, and I seasoned it with salt and a little sumac. 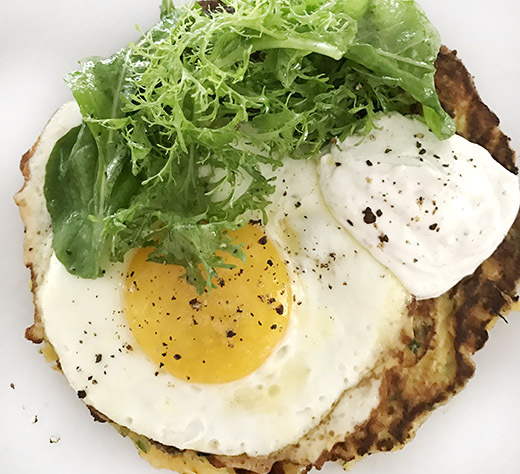 The pancakes were served a dollop of labneh, the dressed arugula, and optionally with a fried egg added. This was a hearty and flavorful brunch dish. The herbs and spices in the socca added a lot of interest, and the arugula and labneh were just the right added components. Seeing how well this dish came together made me eager to try more things from the book. I’ve got my eye on the Brown Rice Horchata sweetened with dates to try next. Recipe reprinted with publisher’s permission from Everything I Want to Eat . Since Sqirl is open for breakfast and lunch, the majority of our customers order one dish, not an appetizer followed by an entrée and a cheese course. So we are always trying to come up with ways to create a single dish that really satisfies. This socca pancake stemmed from that quest. 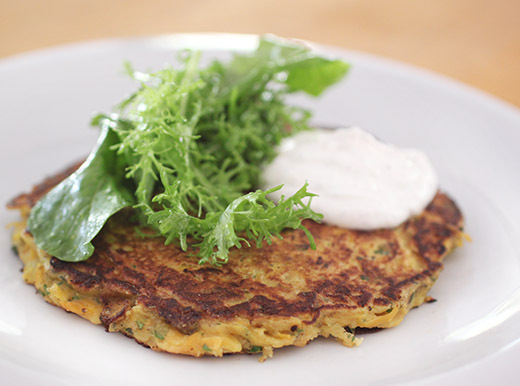 It’s traditional in that it is a flat pancake made of gluten-free chickpea flour, but it’s also not so traditional in that it is filled with lots of vegetables and topped with greens and creamy labneh. Heat a large skillet, preferably cast iron, over medium-high heat for a minute or two. Add the butter, then spoon in two overflowing ½ cupfuls (120 ml) of the pancake batter, pressing each to 1/2 inch (12 mm) thick. Cook, rotating the skillet occasionally for even browning, until the pancakes are nicely browned, about 3 minutes. Flip, then cook the second side for another few minutes. Transfer the pancakes to a plate. Repeat to make two more pancakes, adding more butter to the skillet, if needed. 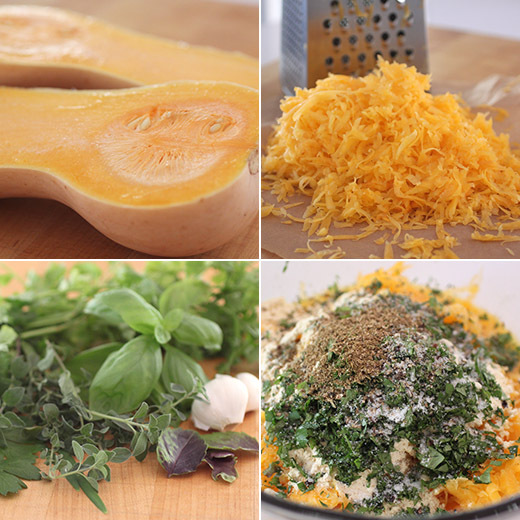 NOTE ON THE WINTER SQUASH You can use any kind of winter squash that you like. We usually go for kabocha. If you’re having a hard time grating the squash on one of those handheld box graters, try cutting the squash into 2-inch (5-cm) pieces and then shredding them in a food processor. WANT TO MAKE IT HEARTIER? Add a fried egg on top. SPICE UP THE LABNEH Have fun with the seasoning. Try mixing in ras el hanout or za’atar. Do you have a favorite homemade treat from your childhood? Maybe a cake your Mom used to make? I was reminded of one while reading my review copy of The Italian Baker: 100 International Baking Recipes with a Modern Twist by Melissa Forti. This book is a collection of sweet treats from Melissa’s Tea Room and Cakes located in Sarzana in northwestern Italy. The recipes have been gathered from all over the world from Forti’s travels and have been adapted to Italian tastes. While reading the book, I couldn’t help feeling more than a little jealous of her life. She bakes wonderful cakes and other sweets, changes the menu daily for a crowd of regulars, and all this happens in a charming area of Italy. It was the recipe for Fette All’Ananas, or Pineapple Squares, that reminded me of a pineapple cake my Mom baked when I was growing up. I haven’t tasted that cake in years, but I was sure I had the recipe filed away somewhere. I started searching for it, thinking I had a hand-written card tucked into my recipe binder, but came up empty handed. Thankfully, a quick text message to my Mom was all that was needed for her to send the recipe to me a few minutes later. I remembered her pineapple sheet cake had coconut in the cream cheese frosting, but I had forgotten that pecans were in the frosting as well. These pineapple squares from the book are a little different and maybe a little less decadent with no frosting, and I’m so glad to now have both recipes in my possession. The book offers a range of sweets from elegant, celebration cakes to cookies and candies. But, the recipes are not difficult to create. I’m so curious to try the Red Wine Doughnut Cookies made with olive oil, red wine, and aniseed and the luscious-looking Semolina and Ricotta cake which is a cheesecake with orange and lemon zest. Also, I’ve done several web searches and made several calls in an attempt to locate the Italian liqueur made with peach leaves called Persichetto. It’s the primary flavoring in a pretty bundt cake, and I’d love to taste it. I have yet to find a way of getting it here, but I’ll keep trying. There are also pound cakes, tarts, and more to try. Of course, the first thing I tried, though, was the Pineapple Squares. An eight-inch by twelve-inch pan was suggested for these squares, but I don’t have one that size. Instead, I used a nine by nine-inch pan and lined it with parchment. 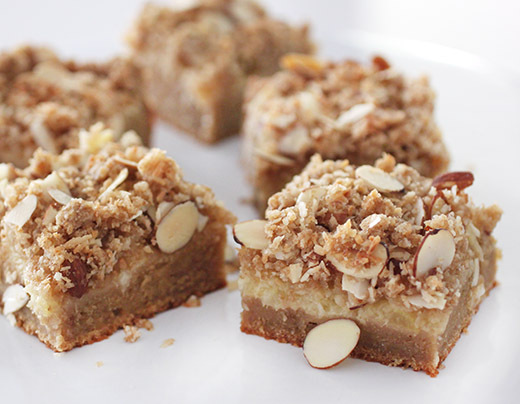 First, a crumble topping was prepared with flour, sugar, and butter, and sliced almonds were stirred in at the end. I added some unsweetened, grated coconut just to make this more like my Mom’s pineapple cake. Next, a cookie base was made by mixing butter and sugar, and I used coconut palm sugar. Two eggs were added followed by flour, buttermilk, vanilla, and almond extract. This mixture was spread in the bottom of the prepared pan. Next, canned pineapple was supposed to be used, but I used fresh instead. I pulsed chunks of fresh pineapple in a food processor and then transferred it to a strainer to drain away some liquid. If you do this, set the strainer over a bowl so you can drink the drained pineapple juice later. The chopped and drained pineapple was spread over the cookie base. Next, the crumble topping was sprinkled on the top. Because I was using a slightly smaller pan than suggested and because I added coconut, I had plenty of crumb topping. Note: I sometimes double the quantity for a crumb topping to be sure there’s “enough.” This time, that wasn’t necessary. The pan went into the oven for about 40 minutes until the topping was golden. Recipe reprinted with publisher’s permission from The Italian Baker . Pineapple is thought to have amazing effects on our body. If consumed regularly it can burn fat and, even better, it contributes to a positive uplifting mood. So, let’s bake a pineapple slice and smile! Preheat the oven to 180°C/350°F. Butter a 20 x 30-cm/8 x 12-inch brownie tin and line with baking parchment. Prepare the crumble. In a food processor, pulse the flour, sugar and butter until crumbly. Stir in the slivered almonds by hand and set aside. In the bowl of a stand mixer, or in a mixing bowl and using hand-held electric beaters, beat the butter and sugar together until pale. Beat in the eggs one at a time. Fold in the flour, buttermilk, vanilla and almond extract to combine. Spread the mixture into the prepared tin. Open the pineapple can, drain off the juice and roughly chop the pineapple. 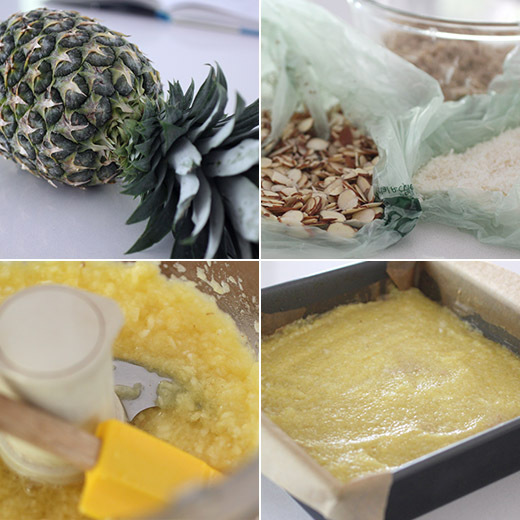 Spread the pineapple over the top of the mixture in the brownie tin and sprinkle with the almond crumble. 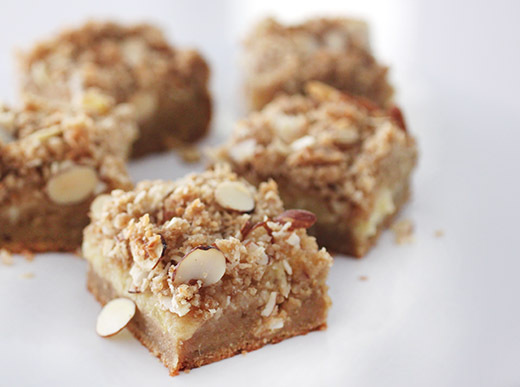 Bake in the oven for about 40 minutes until the almond crumble is golden, then leave to cool in the tin on a wire rack before cutting into squares or slices. I love the simplicity of cooking fish. There isn’t much to it, but as usual when it comes to things that are simple, it has to be done right. Timing is everything, and the timing for cooking fish is directly related to the type of fish and the thickness of the piece being cooked. My preference for most fish is for it to be just cooked through so that the center is less cooked than the edges but not completely raw. Wild salmon is easy to cook because you can keep an eye on the thick edge to see the color change as it cooks through. And, I’m enjoying as much of it as possible right now since the season for fresh, wild salmon is coming to an end. 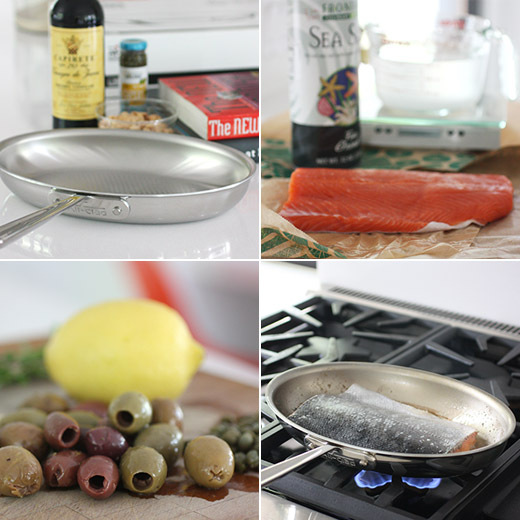 Last weekend, I was thrilled to try a new pan I received from All-Clad that’s perfect for cooking fish. It’s the d3 ARMOR Fish Pan (Retail Price: $199.95), and you could win one of your own! It has a riveted surface on the bottom of the pan that makes it easy for the fish to release after being cooked. It is an oval shape that’s 13 inches long with flared sides to contain splatters, and it has a long handle. 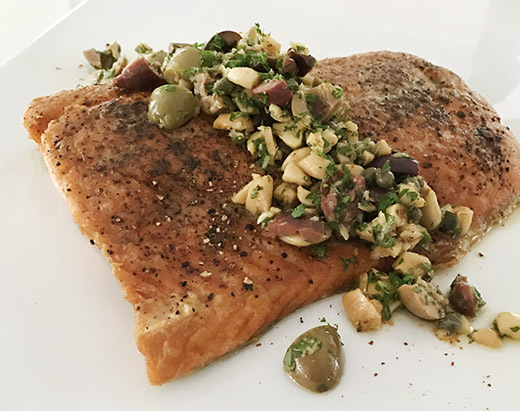 I used the pan to sear a salmon fillet and made a chunky, nutty salsa to serve on top. I learned a brining tip from the book Ad Hoc at Home that I always use when cooking salmon. It only requires about 10 minutes of brining, and it adds great flavor to the salmon and prevents the white spots of coagulation from forming on the surface when it cooks. You just mix cold water with sea salt at a 10 to one ratio, stir to dissolve the salt, pour the mixture over the salmon, and leave it for 10 to 15 minutes. Then, I dry the salmon, season it, dredge with flour, and it’s ready to sear. After brining, only a very small amount of salt is needed for seasoning, and I also season it with black pepper and piment d’espelettte. For the salsa, I took inspiration from a recipe in The New Spanish Table but made a few changes. I used Marcona almonds, a mix of green and black olives, added lemon zest and juice, and used sherry vinegar. Garlic, parsley, fresh oregano, and olive oil were added to the salsa. Cooking with this new pan was fantastic. It’s just the right size and shape for fish so the heat is focused right where it needs to be. The flesh-side of the fillet released easily after cooking, and turning the piece was a breeze. 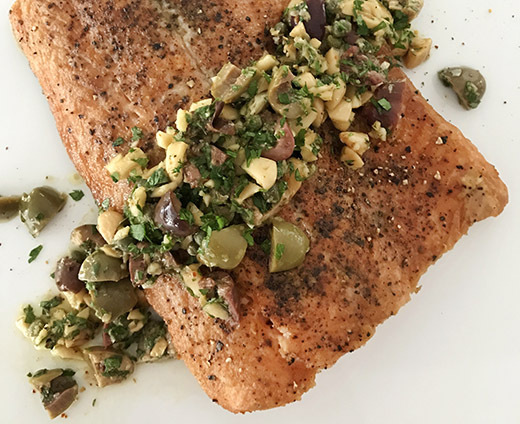 Brining makes the salmon deliciously seasoned all the way through, and the nutty olive salsa was crunchy and zesty on top. Now, for a chance to win one of these pans, just leave a comment on this post including your email address so I can contact you. A winner will be randomly selected on Friday October 14th, and the winner must be a US resident. Good luck, you’ll love this pan! To prepare the salsa: Combine all ingredients in a small bowl and allow to rest at room temperature while the salmon is brined and cooked. To brine the salmon, place the fillet in a baking pan. Combine enough water to cover the fillet with 10% by weight sea salt. I use a digital scale and place a measuring pitcher on the scale and zero it out. I add enough cold water that I’m sure will cover the salmon and check the weight. Then, I add 10% of that weight of salt and let it dissolve in the water. The salt-water mixture is then poured over the salmon, and it’s left to brine for about 10 to 15 minutes. After brining, remove the salmon and pat it dry. Season very lightly with salt, normally with freshly ground black pepper, and to taste if using piment d’espelette. Dredge the top of the fillet with flour and shake off excess. Heat the All-Clad d3 ARMOR fish pan over medium heat with enough olive oil to barely, thinly cover the pan. After a few minutes, when you’re sure the pan is hot, carefully place the salmon flesh-side (the side that was dredged in flour) down in the hot pan. Leave it to sear for about five minutes. Shake the pan gently to see if the fillet is loose enough to turn. Use a wide spatula to turn the fillet and guide the cool side of the salmon with your free hand to carefully turn it to skin-side down. Let cook for another four to five minutes depending on the thickness of the fillet. Remove from heat and let the salmon sit for a few minutes before serving. Transfer the salmon fillet to a serving platter and spoon the almond and olive salsa over the top.